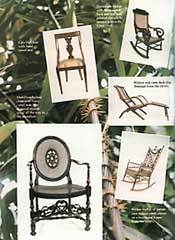 A descriptive guide with step-by-step photographs for restoring cane, rush, splint, danish cord, rawhide and wicker furniture. 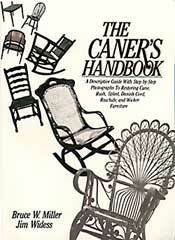 "Of all the myriad of reference books I have acquired in the 25 years working in the seat weaving business, The Caner's Handbook is by far the best and #1 on my entire list. I was fortunate to purchase my first book (in hardcover), right after it was published in 1984. 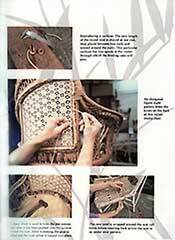 I had already done every type of seat weaving covered in this book, but through the clear, close-up pictures and accompanying text, was able to fine tune my craft even more. At each one of my seat weaving classes, and whenever someone asks me what the best all around book on seat weaving is, I tell them to buy The Caner's Handbook. 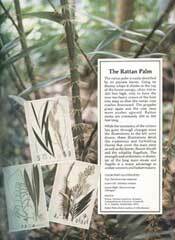 Through the information in this book, anyone can learn to weave with cane, rush, splint, rawhide, Danish Modern, Oriental seagrass, and all types of splints in a variety of designs and patterns. 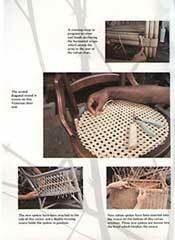 Jim Widess, who besides co-authoring this book, is the owner of The Caning Shop, where he and his employees not only sell materials used in cane and basketry, but have first-hand knowledge of weaving. They have been doing this for a living for many years, so know all the problems and questions the novice as well as the consummate weaver might encounter.